Prior to embarking on the historic Restoration and Completion of St Marys Cathedral, Archbishop Hickey insisted that materials from the original Cathedral were to be respectfully preserved and reused wherever possible. A significant amount of the beautiful 1865 jarrah timber from the original Cathedral has therefore been recycled, refurbished and reused; this includes the timber floor which has been superbly refurbished and re-laid. One of Western Australias leading furniture designers and craftsmen, Glen Holst, was commissioned to create a completely new pew design, one which would afford superior seating comfort whilst utilising much of the original timber. The innovative concept developed was to saw the original seat and kneeler timber into a 4 mm laminate. This material was then pressed to form the seat and back into the full length of each pew. This helped expose the beautiful original jarrah which is rich in grain and colour, not found in modern milled timber. The new design is elegant in form and balance and has been created to reflect the new presence at St Marys Cathedral. The new pews incorporate a more ergonomic and comfortable kneeler with an upholstered pad. The attention to detail in the construction of the pews extends to the carving of the Archbishop's Pectoral Cross on each of the end panels, and over 2,000 carved plugs skilfully used to conceal seat fixings. Editors Note:	DID YOU KNOW... 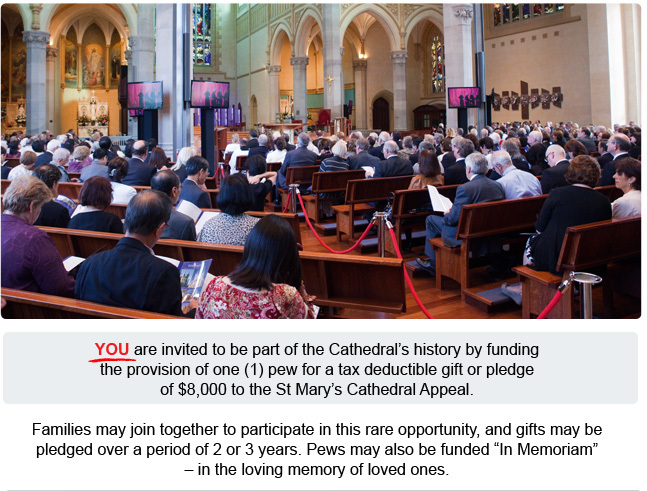 There are 104 pews at the Cathedral, which by a strange coincidence, is also the number of parishes in the Archdiocese of Perth.